My first idea on the theme of this blog was to write about the transition from city to country living. Growing up in San Francisco and living in San Diego, Florence, Italy, and Washington D.C., respectively, the move to San Juan Bautista, pop. 1,800, was quite the adjustment. But after a bit of research I found the whole “city girl moves to country” theme wasn’t all that original. I also realized that I didn’t want to write about myself all the time, so I decided to shift my focus to another favorite topic: food. For the past several years I have been writing on the people and places that make great local food. It’s been a good way to ease into blogging: no deadlines, writing about things I value, taking pictures, and featuring cool friends and current events that relate to local food. About the time I started this blog, I also started writing fiction. The result is my first draft of a novel, working title: Exit Strategy. I don’t expect it to be a NYT bestseller, (although that would be nice!) but at the very least it’s been an exercise in perseverance and creativity, two things I aspire to practice. The story is based on my five years working at one of the nation’s largest, organic salad companies. One could argue that I am sticking to my theme of local food. Set within the walls of an industrial food production facility, Exit Strategy explores the effects of large-scale food production on its workers, its consumers, and its owners. A journalist by training, I was taught to always back up my story with at least three, named sources. In fiction, the novelist’s “sources” are the experiences and characters in her head. My experiences at the salad company included a nationwide E.coli outbreak, several failed attempts to sell the company, one successful attempt to sell it, and countless interactions with the cast of characters we all have in life. I have a fitting analogy to this project. 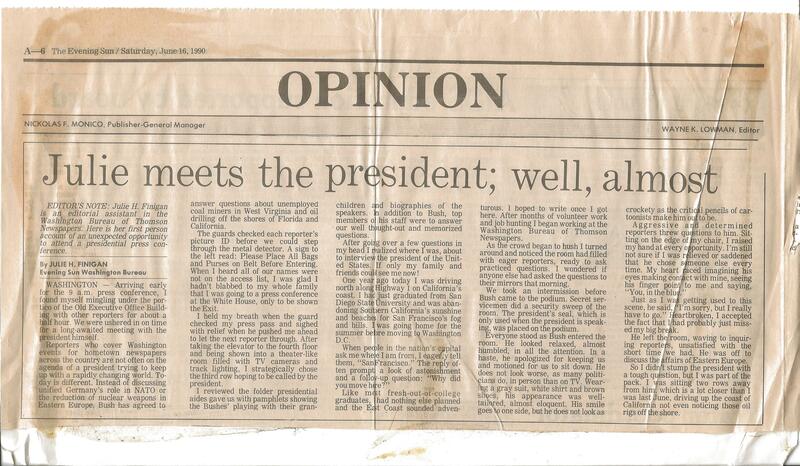 As a fact-checker for Thomson Newspapers’ Washington D.C. bureau in the early 1990s (my first job out of college), I had the opportunity to attend a presidential press conference at the White House. Needless to say, it was a young journalist’s dream assignment. The night before we were to meet the president, I practiced my questions in the mirror. Although I was seated just feet from the president, I was not one of the reporters he called on. Devastated that I had blown my big chance to include an interview with George Bush in my portfolio, I returned to the office and wrote a column instead on what it was like for a rookie fact-checker to attend a presidential press conference. My bureau chief loved it and sent it out to all 122 Thomson Newspapers’ dailies across the country. Some editors gave me a banner headline. My favorite: “Julie Meets the President, Well Almost!” I still have those clips and they’re much more fun to read than the question I was going to ask him about offshore drilling. I compare my five years at the salad company to that press conference: I’m going to get a good clip out of it! This time, in the form of a novel. As the Stanford economist Paul Romer said: “A crisis is a terrible thing to waste.” Stay tuned for occasional Exit Strategy posts to this blog, where I hope, dear readers, you will still find valuable insights about the beauty of local food. p.s. If any of you know someone who designs book covers, let me know. I am looking for one who can beat that Thomson Newspaper editor’s banner headline! Jules, I think you have a lot of good information in here and a bit of a summary. I like it. I looks like you are turning a new leaf so to speak. I think there is quite a bit of info in this blog post you could throw on over to your about page, like the title of the book, like perhaps some highlights of your career. That’s just my humble opinion of someone who is an AMAZING woman. * Published across the nation *Front page headliner on more than… How many newspapers was it? I seem to remember a stack up to my ribs. Also, I wouldn’t downplay the city girl goes to country theme. I think there’s something enlightening in there too especially from a foodies standpoint. Thanks Jules … I may be sending you draft chapters to proofread. Wish we could review together sitting at our table by the window on Via Guelfa.